See a different way things could have gone for Luke with Infinities! 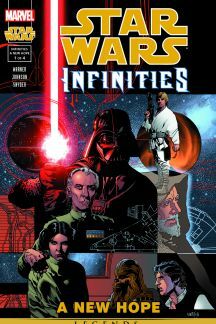 STAR WARS INFINITIES: A NEW HOPE #1 kicks off with a scenario we know all too well: As Han Solo shouts, “Let’s blow this thing and go home!,” Luke Skywalker trusts in the Force, firing two proton torpedoes into the Death Star’s exhaust port. From there, the mighty battle station…doesn’t blow up? Unfortunately for Luke and the Rebel Alliance, one of the torpedoes detonated prematurely, only damaging the Death Star rather than destroying it—and the Star Wars saga as we know it completely changes from that point on. Welcome to STAR WARS INFINITIES—essentially the What If? comics of the Star Wars galaxy. For four issues INFINITIES: A NEW HOPE twists everything we know about the events to follow, managing a healthy balance of new content and familiarity. Obi-Wan instructs Luke to head to Dagobah to train with Yoda, for example, but this happens right away, with Han and Chewbacca along for the trip to the swamp planet. 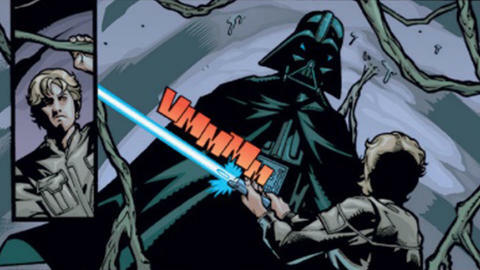 And what happens when Darth Vader turns his attention to tempting Leia to the dark side instead of Luke? It all ends with a showdown between brother and sister, while Yoda takes the matter of destroying the Death Star into his own hands. And if that’s not enough alternate-galaxy Star Wars for you, this series was followed up with STAR WARS INFINITIES: THE EMPIRE STRIKES BACK, where Luke freezes to death on Hoth, and STAR WARS INFINITIES: RETURN OF THE JEDI, where Leia’s thermal detonator accidentally explodes in Jabba’s Palace.